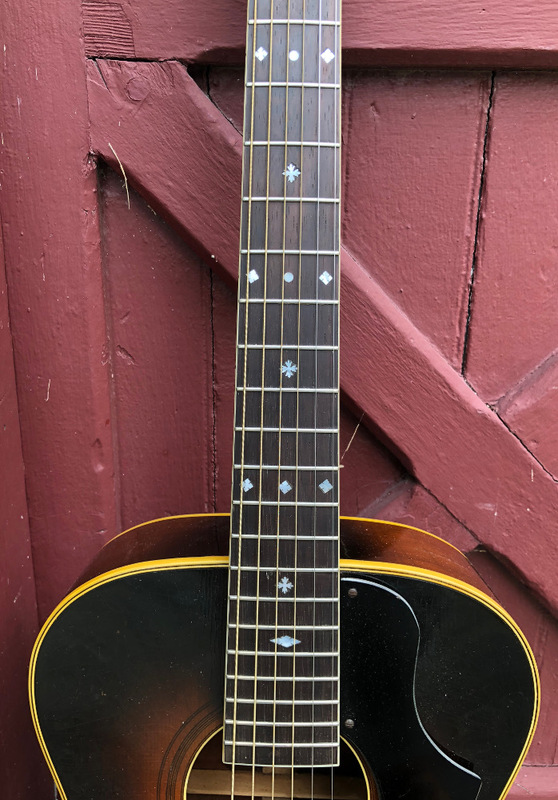 A rare Bacon & Day Señorita Troubadour serial # 35433 c. 1938, likely Regal-made, Chicago, from the Stefan Grossman collection. 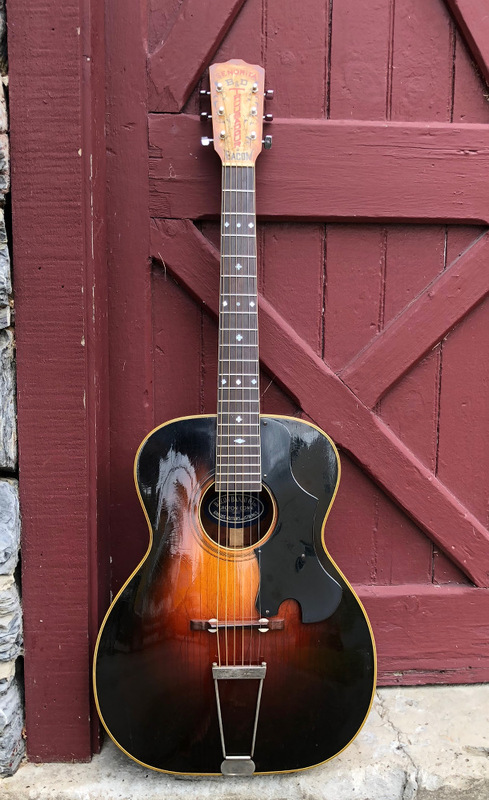 An intriguing if not spectacular example of a late '30s arch top acoustic. But more aptly, the swan song of a dying banjo company. By the late 30s, the glory days of B&D banjos, once highly respected for their tone and ornamentation, were about over, thanks to the lingering effects of the stock market crash of '29 and the fading interest in tenor banjos. B&D had by this time contracted with Regal in Chicago to build guitars to their specs that were ornamented in high style, reflecting their highly ornamented banjo line. We'd never seen another Señorita Troubadour outfitted with the Señorita Troubadour Bacon headstock and the fancy fingerboard inlays. The guitar is very well made and not the typical 'factory' slap-it-together hodgepodge. The body is mahogany and measures 15 3/16" across at the lower bout, the back is basically flat, like that of a flat top. It's 4 1/4" deep at the end pin. The top is spruce, ladder braced and bound in wbw binding with a round sound hole adorned with black purfling rings. 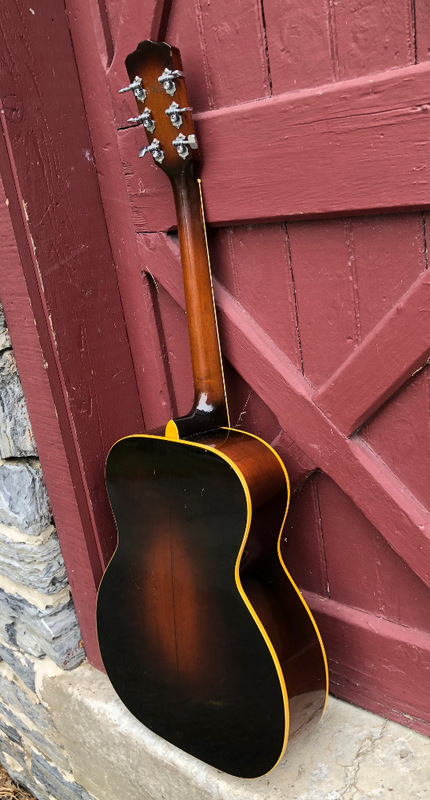 The neck is mahogany and carved in a very modern feeling 'C' shape. It's 1 3/4" wide at the nut with a 25" scale length. The fingerboard is ebony inlaid with pearl markers. The headstock is overlaid with celluloid and engraved with the B&D model name and trailing vines. 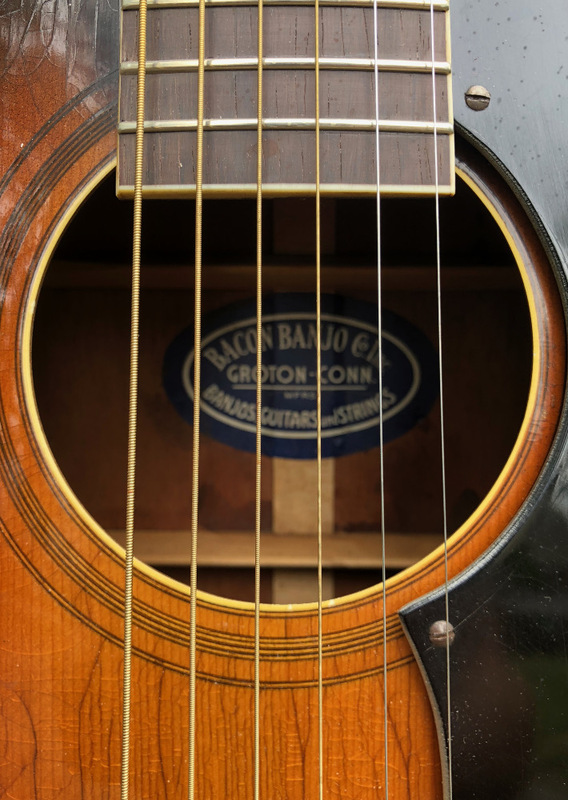 The pick guard appears original (the cut out likely accommodates an add-on pick up control knob). Tuners are stamped Grover. Bridge is Brazilian rosewood with adjustment wheels. 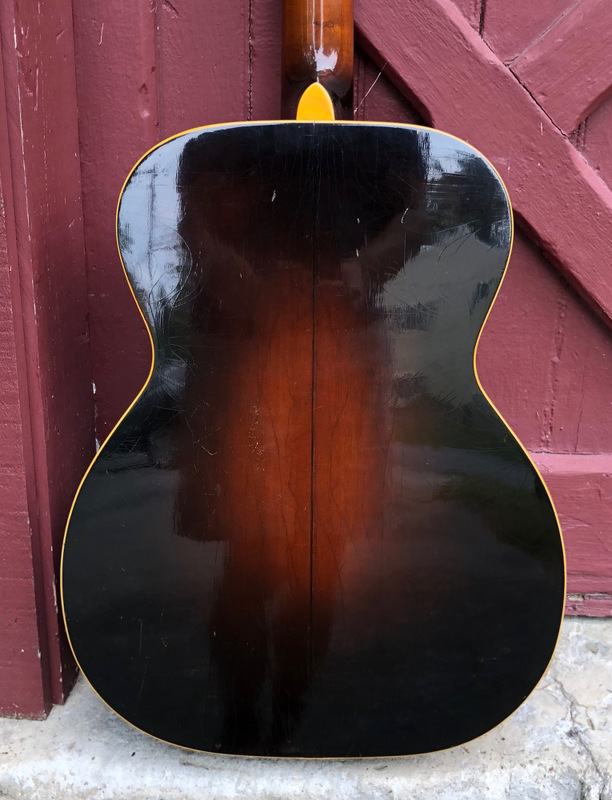 There appear to be no prior repairs to the guitar except for a bit of the head stock overlay, which was recently reglued. The sunburst finish is deep and rich and sparkles like it did in the '30s. Very little play wear and only a few nicks and dings from time and use. The guitar is well set up and plays easily with low action. It has a strong arch top snap, but is also an effective finger picker for those seeking a slightly different tone. This guitar would appeal to both players and collectors.